Introduction What is a Seafly? The Seafly is a one-design dinghy designed around 1960 by J. V. Kelley. 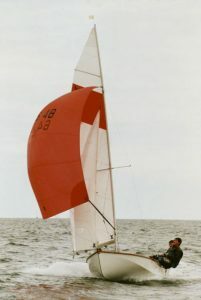 It is a fast, non-trapeze dinghy with superb sea-keeping ability, well balanced on the tiller and very fast to plane on a reach. Resembling a larger version of the Mayfly dinghy, the Seafly has a single chine hull, 14’9″ (4.49m) in length and with a 5’9″ (1.75m) beam. The sail area is 120 sq.ft. (11.14 m2) with a 135 sq.ft. (12.54 m2) spinnaker. The distinguishing characteristic of both Mayfly and Seafly is that the chine is upswept to the bow to give a wide, buoyant section forward with a large planing surface aft. The performance is especially good in stronger winds and rougher sea conditions when gybing still remains an easy operation. The light handling and high stability also make the Seafly an excellent dinghy for learning to sail. Indeed, faster and lighter in weight than a Wayfarer, the Seafly is an excellent cruising, racing, and training boat. SeaflyMemories > What is a Seafly?